Color plays an important role in our everyday experiences. It’s a language that can attract your attention or change your mood. For artists, it serves as an important communication link between their art and the observer or listener. While color is most often associated with visual hues, it is also an important quality of sound. Tone quality, tone color, and timbre are all terms used to distinguish different types of sound production—it’s what makes a particular musical sound different from another, even when they have the same pitch and loudness. Each color has its own family full of beauty and individuality. Visually, broken into pure hues, tints, shades, and tones, there is a limitless number of ascending and descending colors within a family. Think for a moment about the differences between a clear blue sky and the many variations that can change it from lighter to darker blue, or the deep and lighter hues of green in the vastness of a forest. 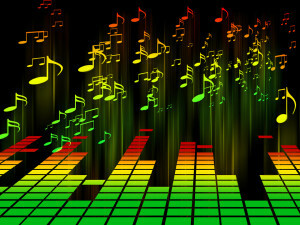 In music, color is divide into families by ascending and descending qualities of sound. For example, the brass instrument family varies in color from the brightness of the trumpet to the darker sound of the tuba, the strings from the violin to the double bass. Music gives color to the air of the moment. The quiet beauty of a family of color (visual or aural) is expanded by the changes that take place as the hues or tone colors are muted, intensified, deepened, or softened. One of the most sophisticated color schemes occurs when all colors come from the same family. In visual art, you experience this effect in monochromatic works. In music it occurs when a work or section of a work isolates a whole family of instruments, such as the entire string section of an orchestra. The most important element in these works of art is value—whether there is enough variety to add interest and movement. Values function in degrees with the darkest colors and sounds serving as an anchor or support for the lightest. It’s not surprising that many artists create works on the same theme so differently—their perceptions are different. It’s true in our lives, as well. Each of us has unique views in observing and feeling the world around us. We regularly translate those ideas into our own perceptions. Our personal values become our deepest feelings and thoughts. Just as artists work with color values to enhance their art, people throughout history have tried to figure out their personal values, tried to live by them, and watched them change as they moved throughout their lives. True artistry comes from within—it’s intuitive—and it’s a lifelong endeavor, whether you’re creating art or your life. as long as you have your values right.